Today I am sharing a pattern for a sachet that would make a great handmade Mother's Day gift. 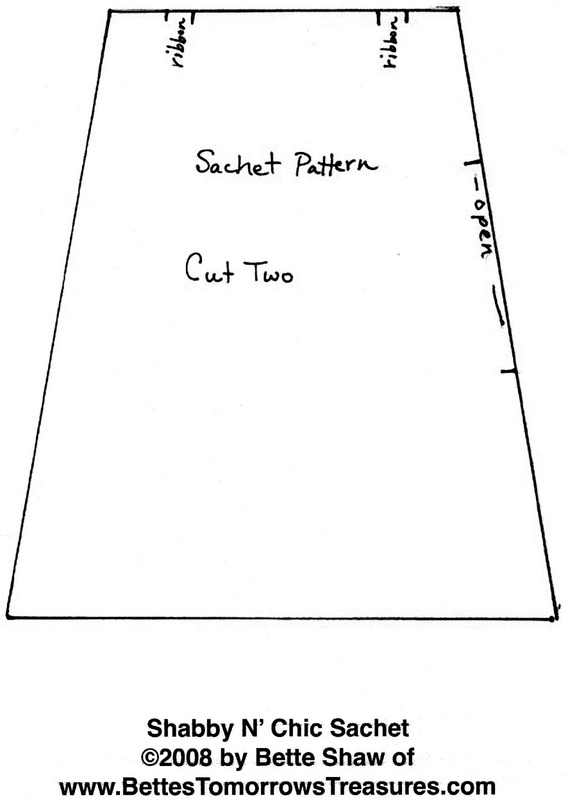 Cut a piece of ¼” ribbon 11 inches long and pin the ends even with the top edge where indicated on the pattern. Make sure the ribbon doesn’t twist and then baste the ribbon to the sachet fabric. With right sides together, pin the other fabric on top. 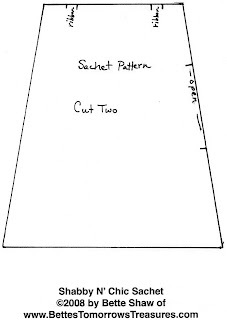 Stitch around the outside edges in a ¼” seam, leaving an opening where indicated on the pattern. The ribbon will be in between the fabric pieces, make sure it doesn’t get caught in the sewn seam. Turn right side out. Stuff with fiberfil and if desired, you can add some sweet annie or lavendar buds inside the stuffing. Stitch the side opening closed with a slip stitch. Turn the ends of the eyelash trim under and pin evenly across the bottom of the sachet. 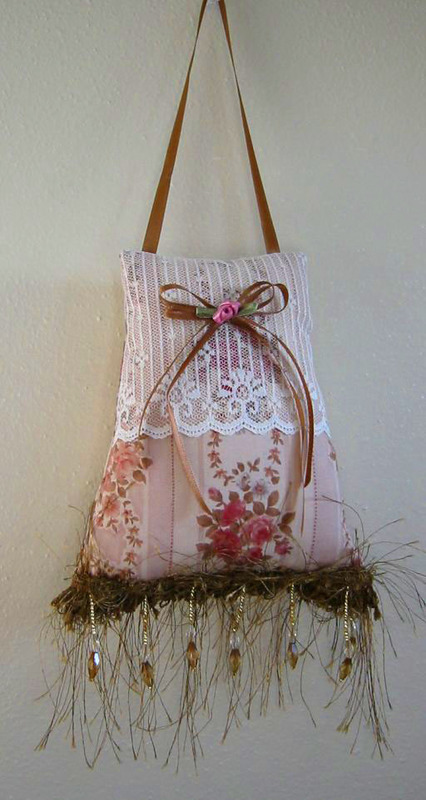 Handsew or glue the trim to the sachet. Cut two lengths of 1/8” ribbon, one 12” and one 14”. Tie two bows and stitch or glue them, together, to the top of the sachet. Stitch or glue a fabric rosebud on top of the ribbons. take a bit of fabric for about 1/8 inch; bring needle out and draw the thread through. clipping any excess thread off. This creates an invisible seam. Click on the pattern to enlarge it to full size and save to your computer and print it out.